Welcome to my blog. Documenting my journey into my 30s with a new glow: life goals, glowing skin and easy style. I cannot believe it's July already! Since I didn't have any new empties this month I thought I would share with you my favorite products this month. 1. Dr. Dennis Gross Alpha Beta Peels: If you follow me on Instagram you have seen my skincare routines that include these peels. The Alpha Beta Peels remove dead skin cells revealing smooth skin, they contain AHAs (Alpha-Hydroxy Acids) which exfoliate skin. The peels also contain BHAs (Beta-Hydroxy Acids) which help to cleanse pores and regulate oil glands. Sounds like a match made in heaven because it is! I wanted to try this product for a full month before I shared any thoughts on this but this has quickly become a star product in my skincare routine. So much so that I'm already planning on repurchasing as soon as I run out. The reason? The Alpha Beta Peels have a cult following because they work, I noticed smooth and glowing skin after just one use. In fact, I didn't realize how textured my skin was until I started using the Alpha Beta peels! I did know that I wanted a more even skin tone and this has helped tremendously with both texture and uneven skin tone. Lastly, the peels also help with acne scarring. Thankfully, I do not break out very often (only hormonal acne) but the breakouts that I have had lately left scarring and the Alpha Beta Peels have slowly removed the scarring. Have sensitive skin? Try these Ultra Gentle peel pads. 2. Fore Luna Fofo: (Not available yet, similar one linked) I am so glad that I was introduced to this product via my Fabfitfun subscription box. I've seen the Foreo products everywhere but never paid much attention to them but that has clearly changed. The Foreo Luna Fofo is able to sync to the Foreo app to give you moisture readings of your skin and give you a customized cleanse. For example, when my moisture readings are normal, I notice that the Luna Fofo will give me a gentle cleanse for the day. I like to do the moisture readings once a week, or more often depending on how different my skin is feeling. I also love the Luna Fofo because I feel like I get an effective cleanse without being harsh on my skin. The Foreo Luna Fofo is also waterproof, I like to keep it in the shower to cleanse my face in the morning. The Luna Fofo is gentle enough to use day and night, at night I use it with my favorite cleanser to remove my makkeup and impurities. 3. Coola White Tea Face Sport SPF 50: Another favorite product that I was introduced to from the Fabfitfun box! The Coola Sport Sunscreen quickly became a favorite from the moment I tried it on. I haven't loved a sunscreen so much since my favorite Unseen Sunscreen by Supergoop. The Coola Sport is very lightweight and sinks into my skin very nicely, when you pour it out it comes out white but quickly turns clear. I love that the Coola sunscreen is also moisturizing, when I use this sunscreen I can skip the moisturizer because my skin feels supple enough for makeup application. I do however recommend letting the sunscreen set completely before makeup application, I noticed a small amount of piling from applying makeup over it. What else is so great about the Coola Sport Sunscreen? It includes evening primrose and linseed oils to help with redness and moisture, it is also Vegan, cruelty-free and 70% organic and has a Clean at Sephora seal. This suncreen is everything I ever wanted in a sunscreen, a clean product, that's lightweight and that I can skip a moisturizer to save time in the mornings. If there is one product you should try for anti-aging, is this one! Remember, in order to prevent fine lines and wrinkles you have to protect your skin from the number one cause of them, the sun! 4. 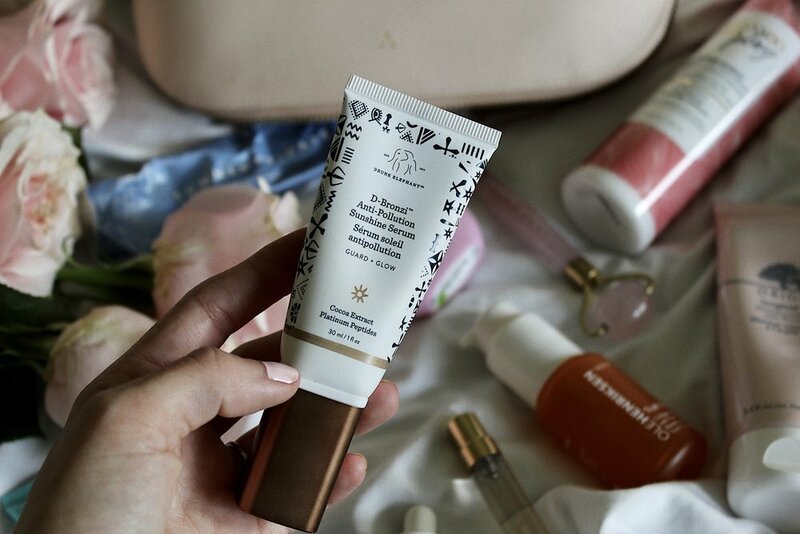 Drunk Elephant D-Bronzi Anti-Pollution Sunshine Serum: You guys already know that I am a big Drunk Elephant fan, so when I was gifted this product I was beyond excited to try it. The D-Bronzi drops are full of antioxidants that help protect you against pollution. You can add the drops to any Drunk Elephant product like the Umbra Sheer, Virgin Marula oil or my favorite the Umbra Tinte to create a bronzed look. I have also added the D-Bronzi drops to my regular moisturizer and it works great! 1/2 to 1 pump of D-Bronzi works for my face and I usually use 2 pumps for my arms/legs. If you haven't tried any Drunk Elephant products this is a good way to start because of its more affordable price point. I feel like this is a must have product for the Summer because you can create a bronzed look without the sunburn. 5. Summer Fridays Jet Lag Mask: Are you tired of hearing about this product already? I'm not because it works! I'm already running low on this mask because my fiance and I love using this product so much. The Jet Lag Mask plumps up fine lines, decreases under eye puffiness, brightens up my dark circles and makes me look LESS TIRED. I like to save this mask for the weekends when I've battled a long work week and my skin looks dull and tired. This product has quickly become a must have in my skincare arsenal, I love knowing that even when I don't feel or look my best the Jet Lag Mask can help me look more refreshed and awake. 6. Origins Original Skin Retexturizing Mask with Rose Clay: I rediscovered my love for this Rose Clay Mask after a Self Care Sunday ritual. Besides the fact that it smells divine, I love how it leaves my skin smooth without being harsh or irritating my skin. This mask also comes with a generous amount so you honestly use it daily and not run out! The first time I tried this mask was after I got a sample of it from Sephora, I used it once and fell in love. The Origins Rose Clay mask makes me feel relaxed and pampered, a perfect pairing for Self Care Sundays. 7. Dr. Jart Cicapair Tiger Grass Camo Drops: I have tried the Cicapair Cream by Dr. Jart and I love it so I thought I would give the Cicapair Camo drops a try this summer. I definitely think that the Camo drops neutralize redness better and are more lightweight than the cream. The consistency of the Camo drops is like a serum and it dries up quickly making it perfect to wear under makeup. I like the pair the Camo drops under my favorite Chanel CC Cream or Drunk Elephant Umbra Tinte for sheer summer ready coverage. During the Summer my skin tends to get more red because of the heat so using this under a sheer coverage foundation is great to use during this time of year. 8. Herbivore Rose Quartz Facial Roller: For the love of facial rolling, this Herbivore Rose Quartz roller is an all time favorite of mine. You have probably seen this in many of my pictures because not only is it photogenic but it works for inflammation, puffiness, lymphatic drainage and helping your skincare products sink in. 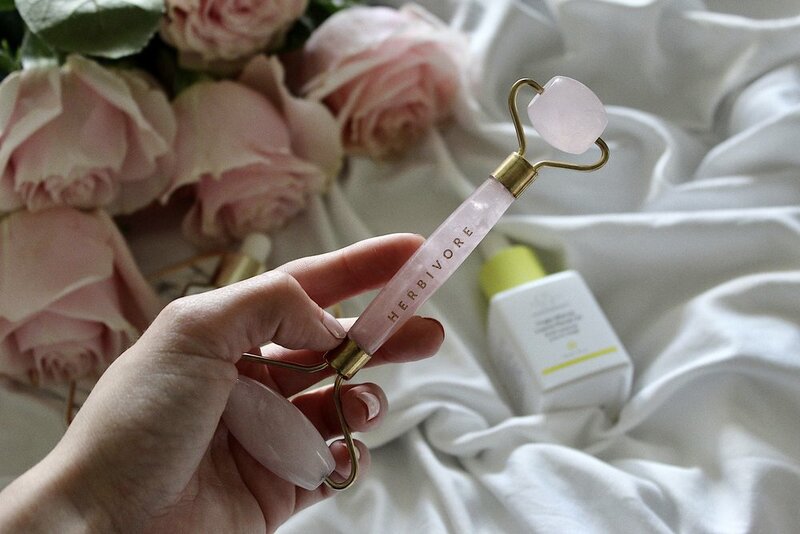 The Rose Quartz roller is a favorite this time around because I love keeping it in the fridge and rolling the cool rose quartz on my face, it is so calming, cooling and satisfying, especially after a long hot day outside! If you haven't checked out my post on facial rolling, you can find it here and if you want to try facial rolling for yourself check this Rose Quartz and Jade roller duo here! 9. Orlando Pita Play Hair Protectant Spray: Another hit from the FabFitFun box is this muti use hair spray that protects against environmental pollutants, shields against heat damage and works to detangle hair. I love a hair product that has many uses, since I don't spend a lot of time on my hair. I don't ever do elaborate hair do's and the most I do with my hair is blow-dry it in the mornings so this Hair Protectant Spray is perfect for me! The Orlando Pita spray helps to detangle my hair, now that my hair is getting longer and I want to keep it nice and healthy, a detangling spray is a must have for me. If you are anything like me and love a no fuss product that does it all, I highly recommend this one by Orlando Pita. 10. Drunk Elephant TLC Sukari Babyfacial: Much like the Alpha Beta peels, this is an AHA/BHA mask that works as a facial to reveal baby soft skin. Works on dullness, uneven skin tone, texture, fine lines and wrinkles. Drunk Elephant's Babyfacial also has a cult following and it's not a surprise since trying it myself (check out my post here). This blend is quite potent, I would say stronger than the Alphan Beta Universal peels but also reveals glowing skin. I love this at home facial, leave on for 20 minutes let it work its magic, rinse with warm water, and reveal a glowing complexion. Babyfacial was my first acid and I am still in love. I love using this a few times a month and following with the Virgin Marula oil, the Virgin Marula oil really calms my skin and it sinks in immediately (my skin is loving this oil). 11. Olehenriksen Truth Serum: It is no secret that I love Olehenriksen products, and one of my all time favorites is the Vitamin C containing Truth Serum. The Truth Serum does the trick when it comes to brightening my skin and making me look refreshed and awake. I love the Truth Serum so much and have repurchased this twice already! I also want to add that my fiance steals this from me all the time, so it works wonders for men's skin as well. So there you have it, my June Favorites, I apologize for the long post but I have really been trying to take my skincare routine to the next level and these products are taking me there! I also added a favorite hair product, if you want me to add more hair products into my reviews let me know! What are your favorites this month? Have you discovered any new products you want to try?